Cognac, a type of brandy, is considered to be one of the finest, if not the finest, of the spirits. It is made from white grapes grown in the Charante region of France, and is named after the town of Cognac in the French region of Charante. Cognac is some-times called "burnt wine" (from the Dutch word brandewijn because the wine is subjected to a double heating. Although cognac is primarily enjoyed as a beverage, it is also used in cooking for sauces, marinades, fruit preserves, and chocolates. Cognac is splashed over dishes for flamed presentations, in marinades, fruit preserves, and chocolates. Necessity, as the mother of invention, certainly describes the development of cognac. In the seventeenth century, the town of Cognac in the French region of Charante was an exporter of salt and wine. The wine was particularly popular with the Dutch and English merchants who visited the region. They would often distill the wine so that the ship voyage home would not affect the quality of the spirit. A vintner named Chevalier de la Croix-Marrons is the first person known to heat wine and then send it back through the still again, thus creating "burnt wine." The wine was then stored in oak barrels. It would be diluted upon arrival. However, the merchants found that the distilled wine had improved with age and by its contact with the wood. In the eighteenth century, two men whose names would become synonymous with cognac, each separately built successful distilleries that manufactured cognac. Jean Martell, a French former smuggler, arrived in Cognac and built a distillery on the Charent River. In 1765, James Hennessy, an Irishman who served in the French navy, also set up shop on the river as Hennessy Connelly and Company. The following year, Hennessy's company received its first order from the American colonies. Soon after, cognac was also exported to the Far East. The name "cognac" was not affixed to the distilled wine until about 1783. At about that time, the French government developed rules for labeling, classifying the cognac by it smoothness. V.S. (Very Superior) is aged at least two and one-half years. V.S.O.P. (Very Superior Old Pale), or Reserve, is aged in wood at least four years. X.O. (Extra Old, Napoleon, or Extra) is that which has been aged at least five years. These are bare minimums. Most houses age their cognacs for twice the minimum required. At first, warehouses were built on the river primarily for ease of transport. Therefore, the cellars were damp. This proved beneficial to the cognac because the dampness reduced its strength but not its volume. A dry cellar produces a harsher brandy. Even today, distillers try to build warehouses near rivers, or they keep their cellars humidified. Since early times, the distillation has been carried out in a large copper pot still, called an alembic, topped with a long "swan's neck". By French law, the stills are limited to small capacities in order to ensure a slow and precise distillation. French law also defines the distillation period. It begins in November and ceases by March 31. 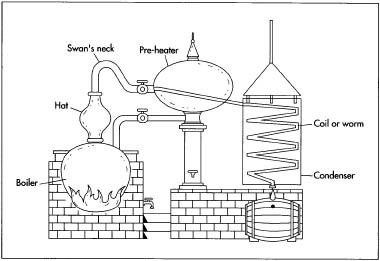 Since early times, the distillation of wine into cognac has been carried out in a large copper pot still, called an alembic, topped with a long "swan's neck". By French law, the stills are limited to small capacities in order to ensure a slow and precise distillation. One aspect of the distillation process that has changed is the method of heat. At first, wood was used, then coal. In the present day, natural gas provides the heat source. The ideal grapes for distilling cognac are Colombard and Saint-Emilion. Blanche, Folle Juirancon, Monfis, and Sauvignon are also used. They are grown in six specific subdivisions, or crus, in the delimited region of Charante established by the French government in 1909. Each cru produces a distinctive flavor. Grande Champagne, the area around the towns of Cognac and Seconzac, yields the most delicate and fragrant brandy. Grapes in the Petite Champagne, which surrounds Grande Champagne on the southwest and east, are faster to mature and less subtle in taste. In the hills north of Grande Champagne is the Borderies. Grapes grown here produce a rounder and softer taste. Brandy made from grapes of the remaining three areas, Fins Bois, Bons Bois, and Bois Ordinaires, are used primarily to flavor other brandies. The grapes are harvested in the winter when they are fruity and have the potential to produce juice that is 8-9% alcohol. Grapes with less than 8% alcohol are too pale to produce the desired aroma; those with more than 9% possess an inadequate concentration. The wooden barrels, or casks, in which the cognac ages are an essential element in the process. Tannin and vanillin present in the wood lend their properties to the cognac. One-hundred-year-old trees from the forests of Limousin and Tron, ais are the primary types used. Limousin wood is extremely rich in tannin and accelerates maturation. Tron, ais wood releases its tannin at a much slower rate. A side effect of this process is the blackening of the walls and roofs of the warehouses caused by the growth of fungus. Most of the major cognac producers control the manufacture of their casks. After the wood is split, it is stacked and seasoned in the open air for a minimum of three years. In the cooperage room of the distillery, the cooper shapes the wood into barrels. Metal bands hold the planks of wood together so that glue and nails, which would affect the flavor of the cognac, are not necessary. It takes nearly half a century for alcohol content of the distilled brandy to decrease to a drinkable 40%. To facilitate the maturation process, distilled water and other varieties of brandy are blended in to the cognac. Caramel may be added to even out color variations. Sugar syrup may be added to sweeten and enrich less mature brandies. 1 The grapes are pressed and the juice is allowed to ferment naturally. No sugar or sulfure dioxide is added. 2 As soon as the wine has fermented, it is poured into pot stills enclosed in brick kilns. Each still holds approximately 660 gallons, or the equivalent of 3,000 bottles. The kilns are heated to a temperature range between 173°F (78.3°C) and 212°F (100°C) until the alcohol vaporizes and separates from the rest of the liquid. 3 The vapors are collected in the cowl and the swan's neck of the still. They then pass into the serpentine-like condenser coil. The condensed liquid, called "broullis," is reduced one-third from the original amount and measures about 30% alcohol by volume. 4 The broullis is heated a second time in a process known as "bonnechauffe." This is a exacting process because the distiller has to decide at what moment to isolate what is known as the "heart" of the liquid, to separate it from the "head" and "tails." The head portion is too high in alcohol content while the tail is lacking in substance. These portions are redistilled several times and used in blending. 5 The remaining liquid is the clear "eaude vie." It has been reduced by an additional one-third and is 70% alcohol by volume. This significant reduction in volume means that the distillation of cognac is a costly operation. It takes 9 liters of wine to make one liter of cognac. The amount of spirit that is lost to vaporization (known as "the angels' share") can equal more than 20 million bottles annually. 6 The eau de vie is piped into oak casks. The casks are housed in large damp warehouses, or cooperages. The vintage, cru, and date are marked on each cask with chalk. Generally speaking, the brandy is first stored in newer casks for periods between one and two years. The amount of time is dependent on the level of tannin that is desired. Tannin is strongest in new oak, so the brandy must possess enough character to absorb large amounts of tannin. 7 The brandy is progressively moved into / older casks, once again dependent on the finished product desired. The cooper pre-sides over the transfer, tasting the brandy once a year to determine if it should be moved to another cask. Most of the tasting is done by the nose; very little cognac is actually orally tasted. 8 Cognacs over varying vintages and from different crus are blended to create the quality desired. This blending occurs over a minimum of one year with samples taken annually. Representative samples of each blending are kept for at least a decade. Each cognac house has a house style that is consistent year after year. Often this style is passed down from family member to family member as a memory of taste and aroma. 9 The bottles in which cognac is packaged are a source of great pride to each company. Many of the bottles are handcrafted of crystal. They are often sealed with wax and draped with satin ornaments. The cognac is bottled on an a slow moving assembly line at the rate of about 5,000 bottles per hour. Each bottle is inspected and hand-dried. After bottling, the cognac is either packed for shipping or stored for future shipments. Coyle, L. Patrick. The World Encyclopedia of Food. New York: Facts on File, 1982. Lang, Jenifer Harvey, ed. Larousse Gastronomique. New York: Crown, 1998. Robinson, Jancis, ed. The Oxford Companion to Wine. Oxford: Oxford University Press, 1994. Gugino, Sam. "High Spirited." The Wine Spectator (January 31, 1998). "Blending Tools." http://le-cognac.com . (January 17, 2000). "The Cognac of Madame Raymond Ragnaud and Her Children." http://le-cognac.com/raymond_ragnaud/ragnaud3_us.html . (January 12, 2000). "Thomas Hine & Co. Handcrafted Cognac." http://www.le-cognac.com/hine/hine_charte_us.html . (December 1999). Just returned from Cognac. The smaller makers I talked to claimed they used the Ugni Blanc grape. They showed me the vines but frankly I couldn't see the difference. Why didn't you mention the Ugni blanc grape.. is this inferior? Also, Seems like the 4 big players don't actually grow or even distill much of their product. Instead buying or financing/buying tyhe small producers.